Soak the black eyed peas in water for 8 hrs. Drain the water,wash it in tap water for 2 times. In a pressure cooker, add black eyed peas, salt and water, cover and pressure cook for 2 whistles and simmer it for 25 mins. Once it done, turn off the flame. Heat the oil in a pan over medium heat, add cumin seeds, red chilly and cinnamon stick and let them sizzle for 10 secs. Add the onion, salt, garlic and cook, by stirring frequently until it turns soft and golden brown, for 2-3 mins. Add mushroom and fry for 2 mins. Add coriander powder, red chilly powder, cumin powder and turmeric powder, fry for a min. Add little water and chopped tomato, fry for a min. Cover and cook for 8-10 mins until it turns soft and mushy. 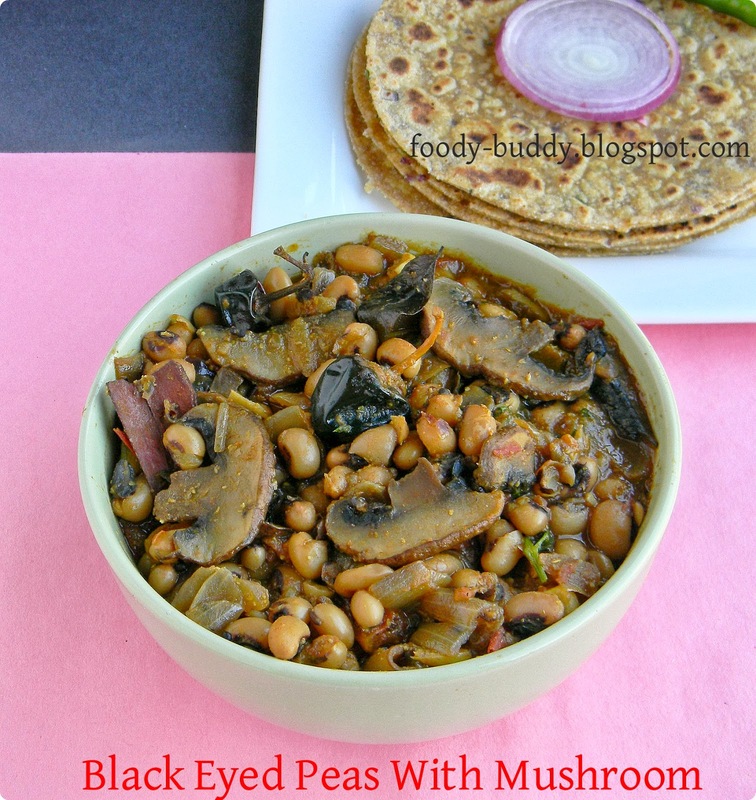 Add the cooked black eyed peas to the tomato – mushroom mixture and simmer, cook it uncovered for 10 mins. Stir in the fresh coriander leaves. Serve hot with roti. You can use dried beans or frozen or canned beans to make this curry. If you don’t have red chilly powder, replace it with cayenne pepper. Add salt while frying onion, so it helps to cook onion faster. If you don’t want mushroom in your curry, try with some other vegetables like brinjal or potato. They are a source of good protein (23-32%) and dietary fiber. Light brown, red and black – eyed varieties are rich in antioxidants. The flavonoids in beans may help reduce heart disease and cancer risk. Phytosterols present in the beans help reduce blood cholesterol levels. 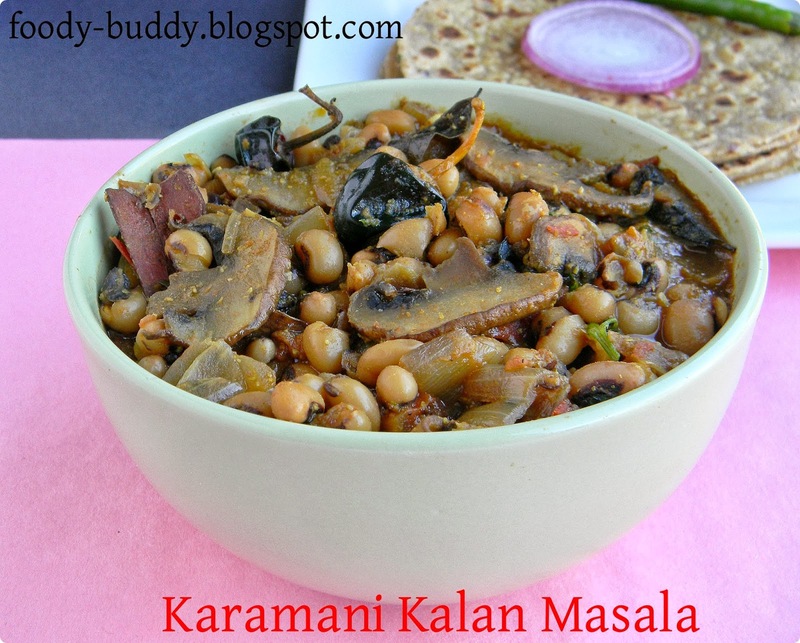 This entry was posted in North Indian Recipe, Side Dishes, South Indian Recipes. Adore the thick gravy and when paired with rotis, its double explosion of flavors. This will be a big take by my other half, simply the meal he will jump high up to. Protein packed food.. Love the combo..
How gorgeous! And what a fun twist – definitely need to try this! wow..perfect for my roties!! very tempting! 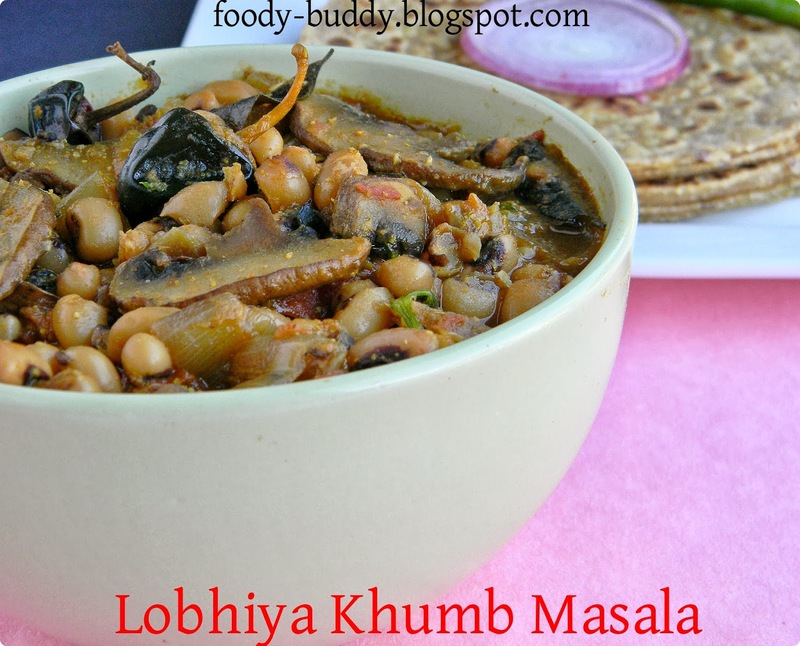 Beautifully done, who can resist to this wonderful,nutritious side dish for rotis.. Protein rich side dish for chapathi; The combination sounds interesting. wow lovely combo and curry is simply tempting 🙂 looks so delicious dear !! Wow the masala looks awesome and really appreciate your effort of writing the health benefit for each recipe. nice combo.even i planned this kind of combination..urs motivating me again.